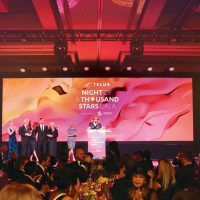 Over 900 guests gathered at the Vancouver Convention Centre on Saturday Nov 7th, and over $3.3 million was raised, making the 20th Anniversary of the Night of a Thousand Stars Gala a glowing success. The $3.3 million raised will fund an interventional (or hybrid) operating room (OR) at Vancouver General Hospital (VGH) that will contain sophisticated radiological imaging equipment. Functioning like a “one-stop surgery shop,” an interventional OR eliminates the need to transport patients to a different location for imaging, which saves critical time. The money raised will also support other urgently needed equipment at VGH, UBC Hospital, Vancouver Coastal Health Research Institute, GF Strong Rehabilitation Centre and Community Health Services across Vancouver. A heartfelt thanks to our donors, sponsors, health care partners, supporters, Gala Committee and volunteers. Together, we are significantly improving specialized adult health care for all British Columbians. If you are interested in supporting the 2016 Night of a Thousand Stars, Email us or phone 604 875 4676 for more information.